XTI Services was founded at a time whereby many companies were forced to improve cost efficiency in order to sustain profitable operations. We serve the highly competitive semiconductor, electronics and their respective related industries, and provide services that helped these companies reduce costs in their operations. Read more about our products and services at on our website. We can source a product that is cheaper and more reliable for your operation. Customers’ satisfaction is our priority. We are a customer-centric, honest and efficient company that aims to be the best service provider. Our staff are constantly reminded to provide services that build long lasting relationships based on reliability and trust with our clients. Our clients cover the electronic sector as well as its relevant upper and lower stream industries. We cooperate with strategic partners around the world, such as Japan, Taiwan, China and United States of America to provide our services. when does elena and damon start dating site de rencontre ain http://www.seo-pruvodce.cz/moloko/3259 recherche zara homme tunisie opcje binarne dla bystrzaków quiero ver hombres solteros number one online dating poemas para una mujer soltera conocer personas en nj berlin dating english Fomblin oil is an inert lubrication oil and sealing for vacuum pump (dry pump) which transfers combustible or corrosive gases. Fomblin oil has superior features such as high resistance to chemical, solvent, thermal and electricity. It has properties of that similar to PTFE/ Teflon but different in the state of matter. It is liquid at room temperature and it has a wide working temperature range. Fomblin oil is used to replace hydrocarbon oil for safety reason as it is a non-flammable lubricant and do not react with corrosive gases. Areas of applications where fomblin oils, greases and lubricants are used include aerospace, automotive, chemical, military, nuclear and data processing. Often used as heat transfer fluids for semiconductor, electronic, electrical and solar energy. Fomblin oil is a very environmental friendly product as the used and contaminated lubricant can be recycled by means of process through advanced filtration methods and be reused. Fomblin oil is a product of Solvay Specialty Polymers. It is one of the most reliable and widely used brand where PFPE oil is concerned. Primarily the demand are coming from the CVD module of the semiconductor industry. The deposition of chemical gases is part of the process to create thin films on the substrate. Vacuum pumps are used on CVD equipment and require PFPE oil for the lubrication. Fomblin oil are very high in molecular weight and are sold in 1 kilogram pack. Y L-VAC grades available are 25/6, 16/6, 14/6 and 06/6. 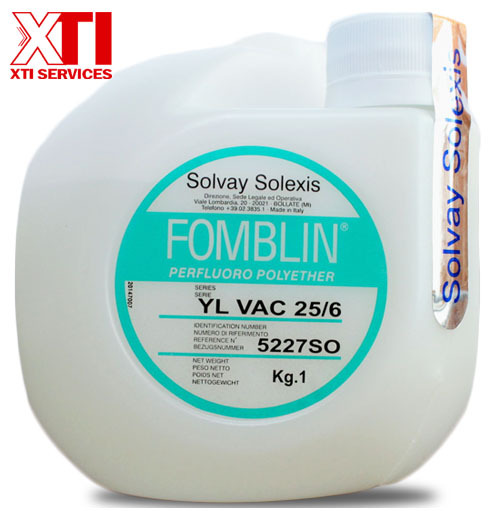 XTI Services Singapore is one of the most trusted supplier of Fomblin Oil (Manufactured by Solvay Solexis) in Singapore. It is No.1 choice of top organizations country-wide in Singapore to purchase Fomblin Oil from. XTI Services is impressively prompt with their response and delivery that you can simply rely on.